n the 28th May 2005 the Countryside and Rights of Way Act 2000 created new rights to walk on vast areas of the Cheviot Hills. These areas, known as Access Land, are now shown on the latest editions of the Ordnance Survey Explorer Maps (1:25000 scale) and this `Right to Roam` legislation has opened up an exciting array of walking possibilities in England`s most northerly hills. The isolated farmstead of Shillmoor stands where the delightful Usway Burn tumbles into the twisting River Coquet. Rising to the north-west, the mass of Shillhope Law dominates a host of fine small green rounded hills. These are quiet hills where cleughs, burns, sikes, hopes and haughs abound and where views stretch out across a seemingly endless landscape towards the northern edge of England. 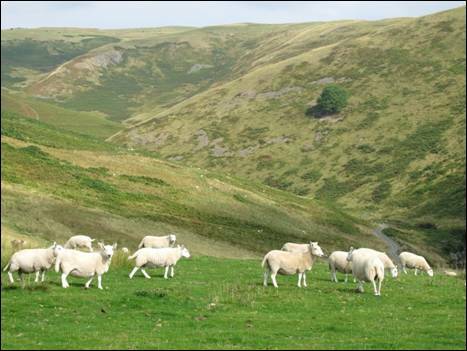 This 7.5 mile walk, part of which takes advantage of the `Right to Roam` legislation, starts at the farmstead of Shillmoor, some 3 miles along the unclassified road through Upper Coquetdale from the tiny village of Alwinton. There is road side parking by the river immediately before the bridge (NT 884078). This area was colonised under the monasteries in medieval times and is now used by the Army as part of their dry training area. However, do not be deterred, there is absolutely no danger whatsoever. Cross over the bridge and turn immediately right down the access road to Shillmoor, where two houses stand on your left. Soon after passing these houses, and before reaching the main buildings of Shillmoor, take the track to your left leading into the valley of the Usway Burn. Ignore the `Private Road` sign as this relates only to vehicular traffic. ithin 100 metres a rough track climbs away from the main track to the left, alongside a stone wall. Follow this track as it continues to climb close to the boundary wall and then a fence. Keeping the fence on your left you will quickly gain further height and when you reach the gate just above the small crags, which lie to your right, glance back over your shoulder. You will see the River Coquet glistening below as it wanders through the valley towards Alwinton and beyond. There are extensive views of the neighbouring hills. Pass through the gate and after further easy climbing along a grassy track you will soon reach the top of Inner Hill. 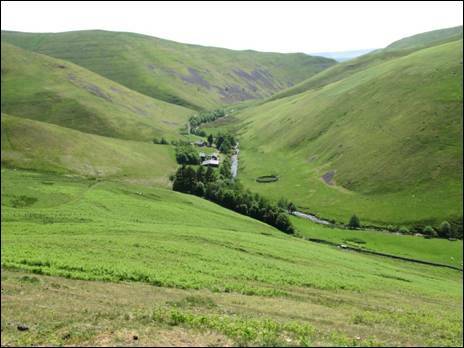 To the west, Upper Coquetdale lies below you whilst to the east winds the narrow valley of the Usway Burn. Continue along the broad ridge, dropping slightly to a col, before crossing the fence, via a gate. You must then follow either of the two tracks which climb up to the trig point of Shillhope Law. This stands at a height of 501 metres and lies just west of the fence. From here there are tremendous views in all directions. 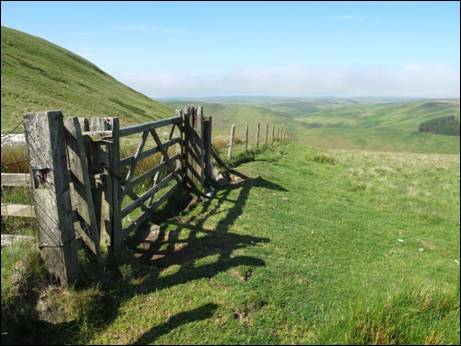 Now return to the fence and descend first in a northerly and then in a north westerly direction along a boggy path. As you begin to lose height you will have superb views down to the lonely farms of Barrowburn and Windyhaugh and beyond to Windy Gyle and the Border ridge. Cross the fence at the gate where it meets another fence and continue straight ahead along a faint track until fairly level ground is reached. At this point you should strike out across the grassy col towards Kyloe Shin and the unnamed hill above. heep traces and quad tracks abound so choose your own route across the col. This is perfect walking territory across sheep-cropped grass. You will need to seek out the highest ground, at 433metres, by continuing in the same general direction as you have come, bearing slightly to your right as you begin to climb. Once the high ground has been reached, continue along the flat top until, to the north-west, you can see below you the forest fence with a ladder stile, a five bar gate and the tree-free top of Middle Hill popping out, like a bald head, from the forest. Head down the nose of the hill on a clear track to the gate and go over the stile into the remnants of the forest. Follow the main track which bends downhill to the secluded valley below. Continue as far as the small wooden footbridge on your right which takes you across the Usway Burn. 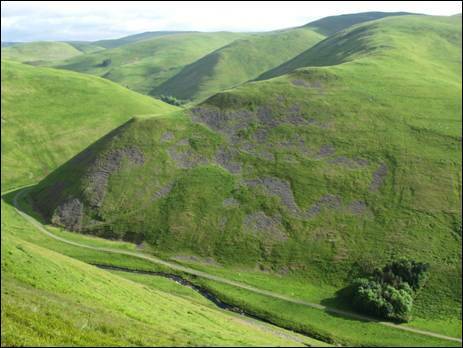 This beautiful burn rises on the southern slopes of Cairn Hill, the south western outhill of the mighty Cheviot, and flows into the River Coquet at Shillmoor, a journey of some 9 miles. En route the burn passes two farmsteads; Uswayford, little more than 1 mile upstream, and Batailshiel Haugh, 2 miles downstream on your route back to Shillmoor. Isolated Uswayford is probably the most remote farm in the Cheviot Hills and was, when Tomlinson wrote his “Comprehensive Guide to Northumberland “ in 1888, only a shepherd`s hut. During the years 1953 to 1960 and 1970 to 1977, the farm was a rainfall station for the Metrological Office. The day to day function of this station was to collect daily rainfall readings at 9.00am and to report these on a monthly basis. Until recently this farm welcomed bed and breakfast accommodation to walkers, many of whom were on the final leg of the testing Pennine Way. tand on the footbridge and watch the burn dance across a series of small cascades as it makes its way down into the dark peat-brown pool just below your feet. Once across the footbridge turn immediately right along the narrow path which passes behind the recently refurbished former shepherd`s cottage of Fairhaugh. After passing the building join the forest track, taking care to take the narrow public footpath which quickly leaves the track to your right and follows the edge of the harvested forest and the valley of the Usway Burn. Now continue along this burn-hugging path through the narrow, steep-sided valley, which only becomes wider as you approach the peaceful farm of Batailshiel Haugh. This former shepherd`s house, which stands at a height of 275 metres above sea level, was referred to in the 13th century charter of Newminster Monastery as “ the shiel of Henry de Bataile” . The word `shiel` derives from the Norse meaning `summer pasture` and the word `haugh` means `flat land beside a river/burn`. The path climbs around the back of the farm, crossing en route the busy waters of Mid Hope, before joining the gravel road away from the farm. The road twists and turns over a number of bailey bridges as it heads down the narrow valley back to Shillmoor farmstead and the majestic River Coquet. This article (with different photographs) first appeared in the August/September 2007 issue of THE NORTHUMBRIAN MAGAZINE.